Digital Business - From Idea to Cash. How leading companies are applying agile monetization strategies to accelerate business velocity. 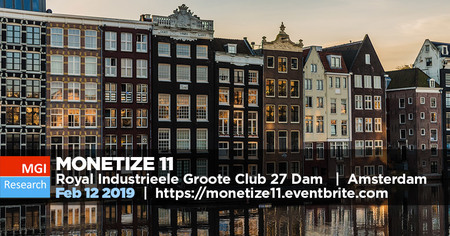 Monetize 11 is the only event in Europe focused on monetization – including payments, commerce, billing, and CPQ. It brings together thought leaders, business and finance executives, IT professionals, investors, analysts, and media. Current business systems and processes are under stress as organizations adopt new business models and support more complex pricing models and payment methods to meet the demands of today's customer. Digital business, the Subscription Economy, and frictionless commerce expose fundamental flaws in ERP systems, and Monetize 11 provides practical insights into how leading organizations are gaining speed and agility with new approaches. BenefitsHear the latest on how organizations are making the shift to subscription billing, improving Quote to Cash processes, adopting new payment methods, and leveraging platform business models. Discover new pricing models, learn how companies are adopting recurring revenue models, hear from FinTech leaders who have bought or sold companies recently, and get the latest research and ratings from MGI Research analysts.